The Adventure Race World Championship 2018 have been completed this Friday, November 16th with the arrival of the final teams, including the Reunionese team Run Zourit who completed the whole race in 8 days non-stop. It is a major achievement for this island shaped by the sport’s history of Grand Raid and they discovered with surprise and generosity that we could also go cycling, climbing, paddling at sea or in rivers. Adventure racing is not like any other sports given. Indeed, it is all a question of endurance, non-stop competition, personal investment, personal commitment, the mandatory team spirit, the necessary sleep management, progression in full-autonomy… all of these are telling stories whatever the outcome is and will remain everybody’s mind for a long time. As the 2018 edition’s motto claims, this Adventure race was « magic ». All the racers have experienced intense moments that some of them share with emotions on the finish line and others keep it secret. Once again, Avaya the reining multi-worlds champions from New-Zealand made the history of the front-race and managed their progression with the regularity and lucidity. Among those four lengedary heroes, Chris Forne, amazing navigator and Stuart Lynch, the quiet force, have pinned a seventh race-number on it. On the podium next to them, the Swedes from Haglöfs Silva and the French from 400Team Naturex who crossed the line only two minutes later after five days of race. On the general ranking, 28 teams had achieved the whole route, 425 km and 16 000 meters elevation gain. Reunionese team Run Zourit touched the graal of the full race after an 8,5 days non-stop progression in the jungle of the island, its volcanoes, its rivers, its coastline. “This is a crazy race, said Thomas Barbereau on the finish line. We have discovered our island in a different light, with the eyes of tiredness. 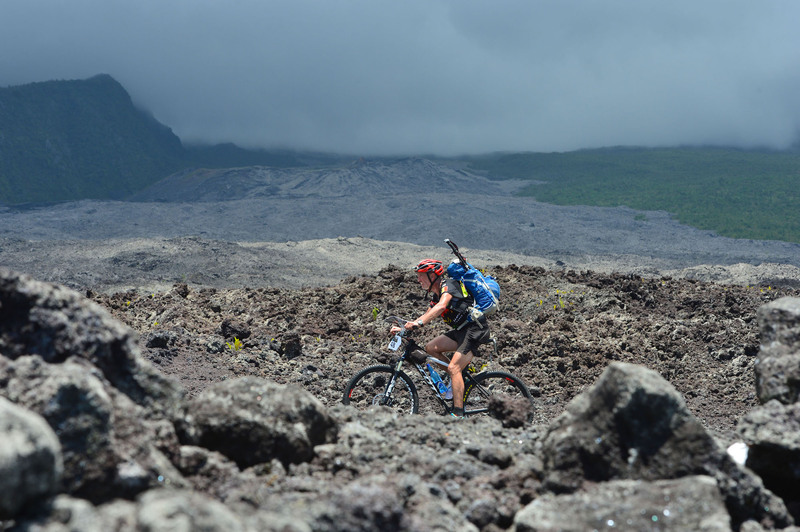 Carry the bike instead of getting on it, upwelling rivers instead of descending, try the Piton de la Fournaise heat and then heavy rainfalls… Progress, together, for one week, manage the sleep as well as possible, tiredness blows, doubt! What an incredible adventure !”. All the racers lauded the Reunionese sense of hospitality. Here, an inhabitant that shows them the way; here another who offers to eat… the liven up of the little story in the great story. And now, let’s welcome the world championship 2019, planned in one year in Sri Lanka, made of rainforests, arid plains, mountains and sandy beaches, and where beautiful epic stories will be written.